There is no Christmas activity more fun than trimming the Christmas tree together as a family. However, making these tin foil ornaments might come in a close second. 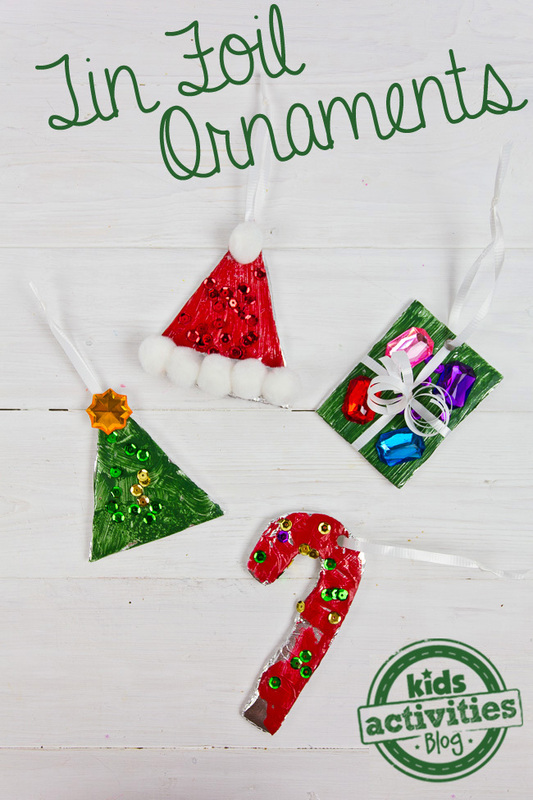 DIY ornaments are a great way to spend time together as a family and the ornaments make beautiful keepsakes to put on the tree year after year. We hope you enjoy this and the many other wonderful Christmas activity posts here at Kids Activities Blog. Every year we create a few handmade Christmas ornaments. Some adorn our own tree, while others are given as gifts to Grandparents, Aunts and cousins. We sign and date them on the back and they are a lovely keepsake and treasured memories of time spent together during the Holiday season. This year, we made these beautiful tin foil ornaments. They sparkle and shine as they reflect the tree lights. We love them. The best part is that they were so simple and fun to make. 1. Cut out festive shapes from your cardboard. We just drew ours freehand – they don’t need to be perfect. You could also use Christmas cookie cutters as a template. Simply place the cookie cutter on the cardboard, trace a line around the outside, and cut. 2. Cover the shapes in tin foil. Again, they don’t need to be perfect. In fact, if the tin foil becomes crinkled, this will give a lovely mottled effect when it comes time to paint the ornaments. 3. Paint the ornaments. Acrylic paint would adhere well to the foil however we used basic kids’ craft paint and it worked just fine. 4. 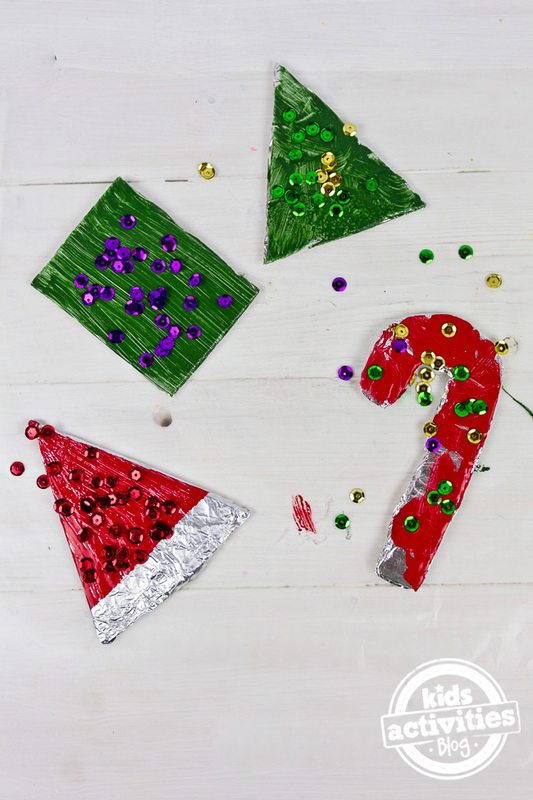 Apply glue to the ornaments and add decorations such as beads, sequins and glitter. Once the ornaments have dried, punch a hole at the top (or simply pierce with the pointed end of a pair of scissors if you don’t have a hole punch), thread through some ribbon or string, and then they are ready to be hung on the tree. They really do look so lovely and colorful. If you are making these as gifts, you could even write a dedication on the back. What a lovely memento for a grandparent, friends or neighbors. 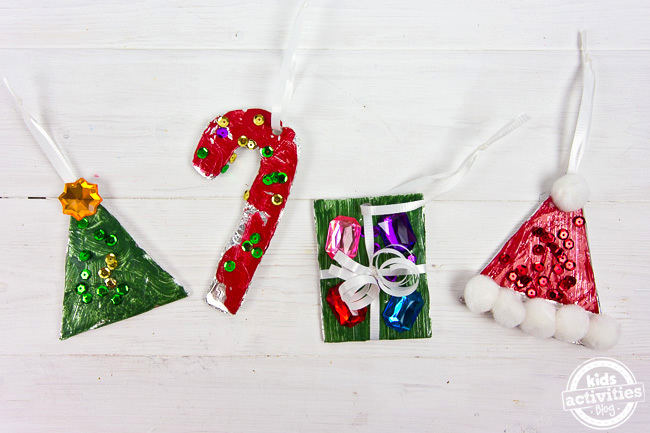 This Christmas activity makes beautiful ornaments that can be hung on the tree every Christmas. Tin foil is so fun and easy to work with. Homemade Christmas Ornaments: make your own homemade ornaments with things laying around the house. 30 Ways to Fill Ornaments: come see the numerous ways you can fill your empty glass ornaments! 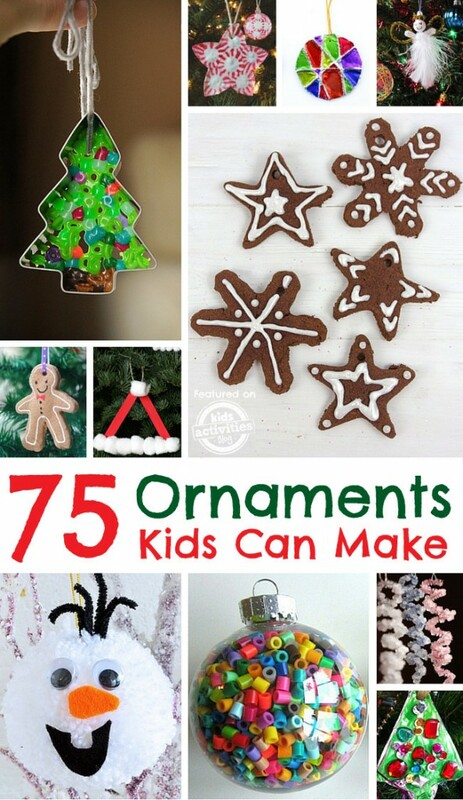 Ornaments Kids Can Make: look at over the 75+ ornaments that your children can make. 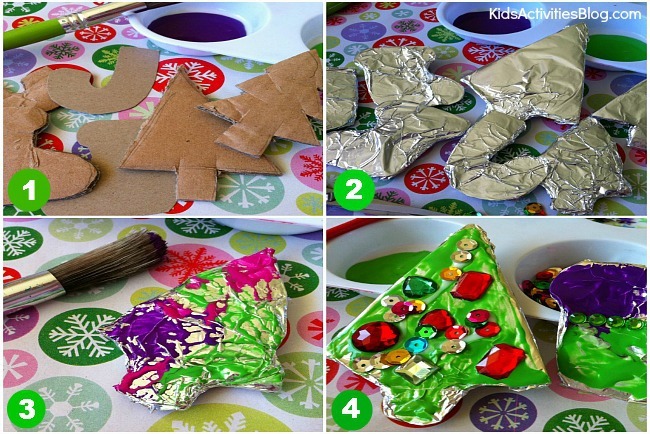 Turn Kids’ Artwork into a Christmas Ornament: transfer your photos onto ornaments! Be sure to follow us on Facebook for more DIY crafts and activities! Ness! Those are so super cute!!! We will be trying them this week for sure! I bet these look great with Christmas lights reflecting off them. Thanks Megan! I hope you have fun with them. Share some pics, I’d love to see them! Thanks Deirdre! The light really reflects beautifully off the foil. Do you make Christmas tree toys? Do you take orders?